Description: BNSF 1560 third in a north-facing line of elephant... wonderful little yard elephants just the same. Description: BNSF 2339 - BNSF 2925 - BNSF 1560 - BNSF 60 ... and this is the perfect example of why I like going to church... with the over-pass atop the tracks. Although, not to be ungrateful, but having a couple more stops of light wouldve been nice. I figured this would be my first and only chance to image BNSF 60, so well only be a half-hour early to church and Ill live with the stinkeye as I blow a good ten minutes trying to get it on sensor. Description: BNSF 6721 first at the north of the power group with BNSF 1560 poking her nose out back on the inspection pit row; our local snow still visible on the ground between the rails and ties in the power corral tracks. 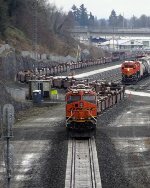 Description: BNSF 1560 in local sort duty - and it seems a new little yard girl that we havent got on sensor before now.